Anyone who is suddenly overcome by cold or shock is scarcely able to move from one moment to the other. The same goes for a horse that suddenly experiences acute laminitis: the animal just stops and stands still, for no apparent reason. It no longer responds to prompting and may even go so far as to lie down. If this happens on the street, in traffic, then it causes quite a stir. The behaviour of a horse that is acutely overcome by laminitis can be explained by the sudden occurrence of intense pain in its hooves, generally in both front feet. Anatomically speaking, they can be compared to the tips of our middle fingers. Laminitis involves reactions similar to what one would experience following a blow to a fingertip with a hammer: haemorrhaging beneath the nail, combined with pressure, warmth and throbbing pain. The pressure increases such that the nail comes loose after a few weeks. In the case of a horse, the ‘blow with a hammer’ originates somehow or other from the inside; there are no external symptoms. The bleeding that occurs within the hoof shoe causes warmth and painful pressure. Around six hundred kilograms of body weight also rests on and causes pressure on the hooves. 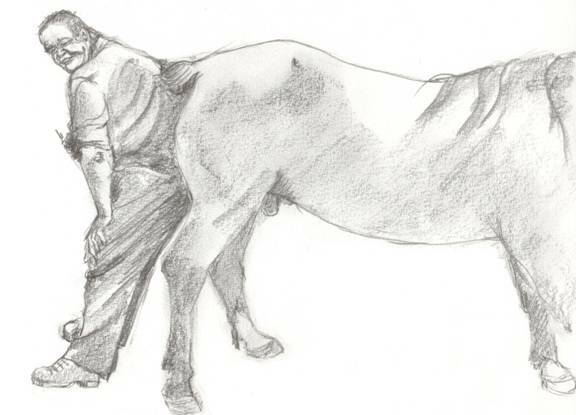 In a situation of this kind, the horse will try to relieve its painful front hooves by shifting its body weight to the rear hooves as much as possible: the animal pushes its rear far backwards. At worst, a horse suffering from laminitis will lie down. Despite extensive research, the cause of the sudden bleeding within the hoof shoe is still unclear. Intestinal infections involving bacteria that generate toxic substances may be the cause of acute laminitis. It may come about as a result of an excess of carbohydrates; these are found in oats and corn. Too much fructan is also not healthy and it is present in fresh grass. The disorder is also described as a complication of some tumours following treatment with certain medications. These are only a few examples described in literature. And so a variety of causes may have the same consequence: laminitis. It is therefore not surprising that the treatment of laminitis in horses differs as well. Up until the seventies, the initial treatment at the clinic in Utrecht was bloodletting. This involved drawing off a half bucket of blood from an adult horse. The procedure needed to be done quickly, and so a thick needle was used. The patient was then given painkillers and the hooves were cooled with water (like you would hold a finger under the cold tap). The hoof shoes were removed and the patient was placed in a box containing wet sand. The horse must fast the first day, followed by a diet of only hay. No dry chunks or oats because of the carbohydrates. At the end of 1970, I was the youngest registrar at the clinic for internal medicine. Professor Wagenaar was head at the time. He was on good terms with his colleague Professor Hulst of the internal clinic at the academic hospital. It was deemed useful for my training to be a veterinary internist that I attend a reference meeting there. That evening’s programme was to focus on the treatment of shock. All of the histochemical reactions involved in the occurrence of shock had recently been unravelled. These new insights formed the basis for a new method of treatment: from then on, the patients going into shock were to immediately be given a maximum dose of corticosteroids (adrenocorticotropic hormones) into the bloodstream, followed by a drip. Not long after that, I am on weekend shift at the clinic when a horse is brought in from nearby. 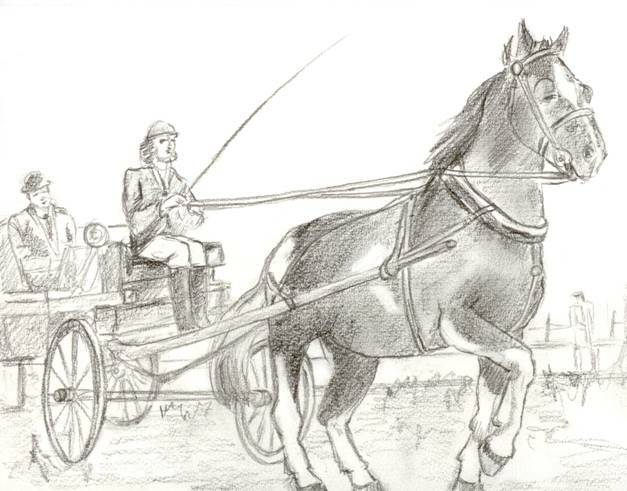 The gelding had suddenly stopped in its tracks during a ride with the carriage and every attempt to get him moving again had failed. Out of sheer necessity, the animal was unharnessed on the spot and a call was made for a lorry. It arrived quickly. A number of bystanders had helped to push the gelding onto the tailboard. Upon arriving at the large sliding door of the clinic the horse must be pushed off the lorry. Getting him inside the clinic is a feat of strength, as his legs point rigidly forward and he is sticking his rear backward. The owner is in tears when she explains: everything was normal up until this afternoon. No, Oscar was not given additional concentrate. Nor was he given fresh tender grass; he was perfectly healthy at the start of riding. This is acute laminitis, but the cause is a mystery. As I examine the gelding, I suddenly realize that the so-called extravasation of serum outside the blood vessels that is present in the hooves looks very similar to shock lung in humans. And does that not require administering the maximum dose of corticosteroids into the bloodstream? For horses, the medication is not prednisone but rather prednisolone. I read the information leaflet in the pharmacy of the clinic. Concerning its use in the case of shock, the leaflet specifies a particular dose: much more than the customary dose. The supply of bottles is just enough for one single injection. In order to be able to assess the effect of the injection, I refrain from doing anything else, meaning no bloodletting, no painkillers and no cold water. After the injection, Oscar is pushed to the nearest stable and placed in a box. The blacksmith will arrive tomorrow to remove the horseshoes. There will also be more people around tomorrow to fill his box with wet sand; that is a huge task for the single stable hand on the Sunday shift. I write FASTING on the small board at the entrance to the box. But Oscar has no interest in food whatsoever: he is lying down stretched out in the straw to relieve the strain on his painful hooves. The stable round starts at 8 am sharp on Monday morning. The chef de clinique takes the lead, followed by the registrars and co-assistants. Everyone is dressed in white. Oscar stands in the first box in the first stable. Yes, he is standing! The temperature chart is hanging next to the door to the box; the imposed treatment is described on the back. The lector raises his eyebrows when he reads it, but he says nothing. I too remain silent, as no one asks me anything. The group proceeds through the various stables. Afterwards, I am taken aside by the chef de clinique. How had I treated that horse suffering from laminitis? With prednisolone? Not to mention the dose! I tell him about the reference meeting in the hospital. And the special dose was specified in the information leaflet. The weekly lunch for the scientific staff is two days later. The tables in the reference meeting hall are positioned like a horseshoe. The professor is seated at the centre of the short table. The head of the laboratory is seated to his left. The chef de clinique is on his other side. My seat is at the end of the long row of tables, near the door. Something is up. We are told what as soon as everyone is seated: the professor informs us that he is not pleased with changes to the treatment protocols within the clinic. And certainly not if these are implemented by the youngest registrar without supervision! I stare at my plate and remain silent. Actually, no one speaks once he has finished. And it becomes even quieter when I stand up and walk past the row of tables to the front. There is a crate full of fresh delicious pastries on a table behind the professor. I present these to him first: “From a grateful owner”. Oscar had been discharged from the clinic that morning following a full recovery. In three days! That is unprecedented. The owner was beside herself with joy. And there are still some pastries left that afternoon. It was years later when I was once again confronted in practice with acute laminitis. 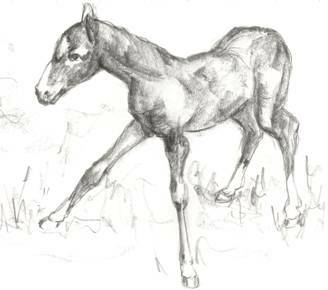 An urgent call comes in concerning a mare that has been carrying for ten months already (the gestation period of a horse is eleven months). By then, she had been spoiled for quite some time with extra concentrate because ‘she is feeding two mouths, right?’ Not surprisingly, the mare is much too fat. This morning during feeding, she had bucked with impatience. But now, a few hours later, she is standing rigid in the box and she is sweating. The blood vessels in the lower legs are swollen and the hooves are warm to the touch. She refuses to lift a leg from the floor: this would shift her full body weight to the other front leg and that hoof too is extremely painful. The risk of an abortion (rejection) is high when animals that are far along in gestation are injected with corticosteroids: you need have no illusions about the consequences of a high dose of prednisolone. And a foal that is born one month too early has virtually no chance of survival. Which is why this mare is not treated with an injection of prednisolone in the bloodstream, but with a traditional painkiller. Her hooves are sprayed with cold water for a long time and she must fast. But she has not improved at all the next day. On the contrary. She is again given a painkiller. The front hooves are wrapped in thick bandages to relieve the pain of standing. But she continues to frequently lie down all the same. Which is why we make a thick bed of wood shavings and lots and lots of straw. After a week, she scarcely stands up at all. Still, she does not develop any bedsores, even though she weighs around 800 kg. So the thick bed is working. Upon changing the bandages, a bulge can be observed in the front section of the sole of the hoof: the coffin bone has rotated within the hoof shoe due to the internal pressure. That bone has a sharp edge. A sole crack becomes evident in both front hooves in the second week: the tip of the coffin bone has broken through the sole and protrudes outward. It is now impossible for the animal to stand; the pain is unbearable. Finally, the foal is born; it is in perfect health despite everything. A stepmother has been found for the foal a few days later and the mare can be put out of her misery by the butcher. The use of corticosteroids to treat acute laminitis is highly controversial. But a once-only injection of a high dose of short-term prednisolone into the bloodstream appears to be the best approach in the initial hours after the disorder has manifested itself. I would even go so far as to try to impose my conviction upon the owner of a mare with young.